Harper is 22 months old now. She is a busy girl. Moving, running, talking, climbing, dancing! When her brother works on a craft or fine motor activities, she wants to get involved so badly! So last week I sat her down in her high chair, I gave her a foam shape, kid friendly glue and some like cardboard cut out things. She glued her shirt and tossed the cut outs. Okay then. So off her shirt goes, the glue is gone. I peeled foam stickers and handed them over. She had fun peeling them off again and putting them back on. When we were finished she was very proud of her foam sticker craft and she has been showing her brother with a question of "Like Picture?" Harper got to experience textures, colors, shapes. 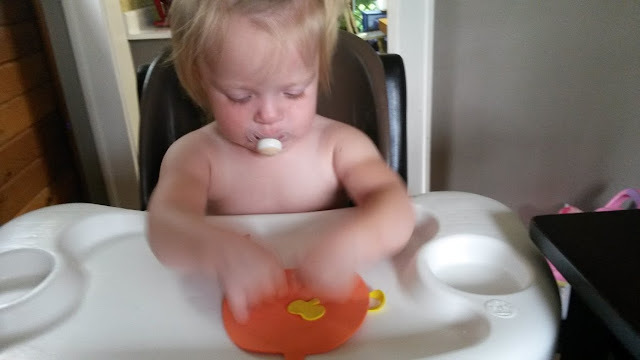 She used her fingers to put the stickers on and take them off again. This gave her a chance to get creative and make something all on her own! We had so much fun with this fine motor exercise! Hi Sara, Im so happy to be following your blog again. Harper is so big and looks like your son. Please forgive me for forgetting his name. Between menopause and chemo brain my memory isnt as good as it used to be. I hope you & your family are doing well.